After working so intently on my Log Cabin Quilt, I wanted to do something easy! I pulled this printed panel top out of my stash and custom quilted it with a point to point sash pattern and an ornate block pattern. The binding is attached to the front and I will hand stitch it to the back during a lakeside vacation later in August. Quick and easy! It is nice to have a quick, uncomplicated quilt to balance out the intensity of a densely quilted one with tiny pieces. 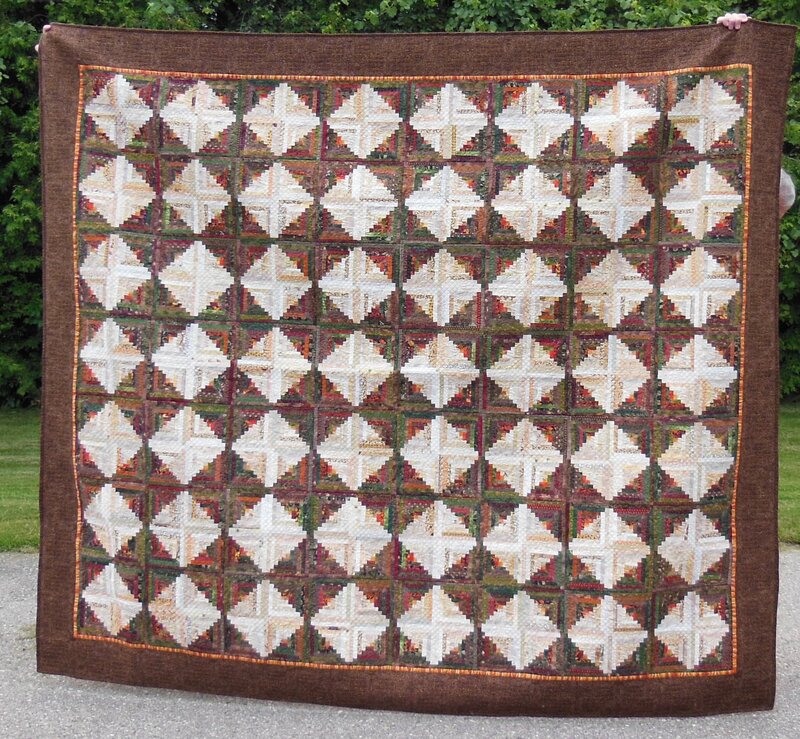 This autumn toned log cabin quilt is my fall fair quilt for this year. One of my goals this year to make a quilt worthy of winning a first prize at the local fall fairs with a possibility of getting to the provincial level of competition. How the main quilt competition operates in Ontario, Canada is thus: A quilter enters a local fair. When the quilter wins Grand Champion, Machine Quilting or Grand Champion, Hand Quilting (one of each at every fair), then that quilt goes on to the district competition later in the fall. The quilt then competes against about 20 quilts at the district competition. The winner of the district competition goes on to the Provincial level of competition in February where the winners of all 15 districts in Ontario compete for the provincial championship. To win the provincial championship is a great honour! I figure if I continue to improve my quilting skills, someday I might win at the provincial level! It’s good to have a goal! 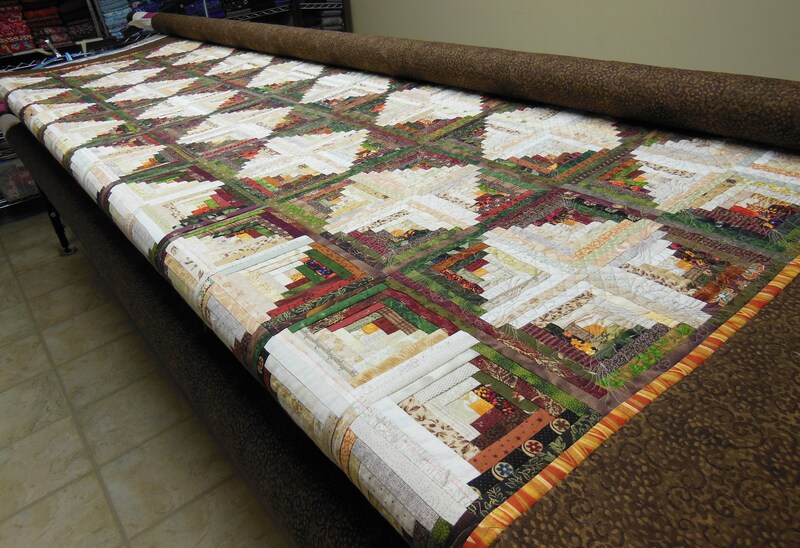 This Autumn Log Cabin quilt contains approximately 4720 pieces. It took much longer to make than I anticipated. For every stage, it took longer than I thought: cutting the fabrics, block construction, top assembly, borders, quilting and binding. I wanted to give up several times, but I forced myself to stick with it. And now it is done!!! Hooray! 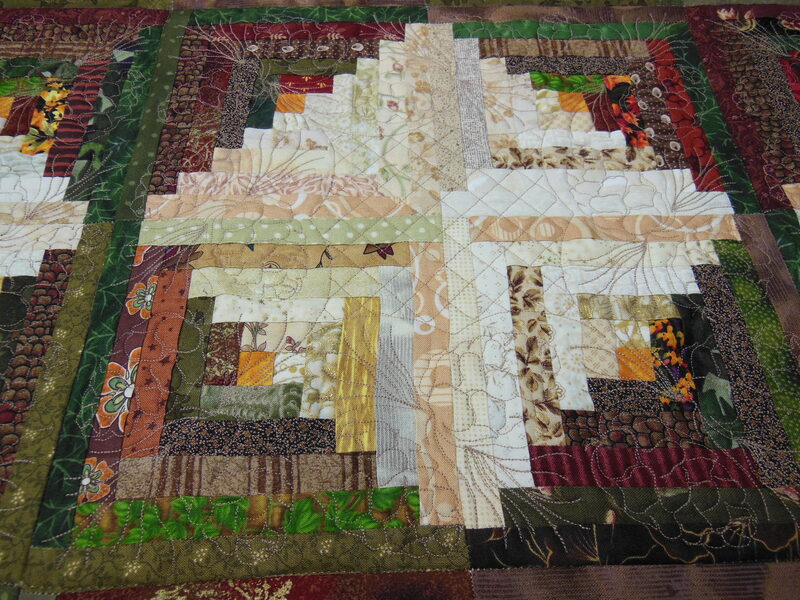 Here is a photo of the quilting, a design called Majestic Pines by Donna Kleinke of One Song Needle Arts. All of the fabric in the blocks is from my stash. When you cut the fabric up for 1/2 inch logs, you can use up a lot of small pieces of stash! This quilt won Grand Champion, Machine Quilting at the Rosseau Fall Fair and at the Arthur Fall Fair. My niece Hillary and her husband Gonzalo chose this quilt as their wedding quilt. 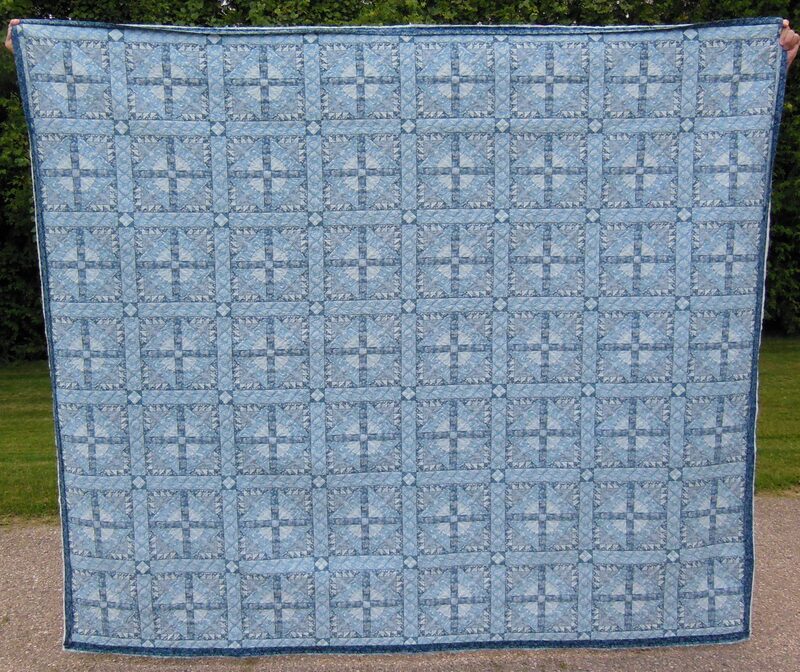 This queen sized quilt began its development as a colour-wash wall hanging kit that I purchased from Kathy, a quilting friend, when she purged her stash in 2002. After buying it, I decided that I do not care for color wash, so I opted to make the fabric pieces into four patches with white fabric in the alternating blocks. Although I enjoyed making the blocks, when I was finished, I had no idea for their use that seemed quite right to me. So they sat in a box for about 10 years. Last winter, in my quest to finish things, muttering the mantra that “Done is better than perfect”, I decided to finish them. I set the blocks with the purple, a fabric I bought in the Hispanic section of Queens, NY. I had been out with my friend Barb, shopping for Spanish books, but happened to come across a fabulous fabric store with prices that I could not resist! So I bought lots! An interesting side note, a customer in the store was purchasing bolts and bolts of fabrics to be shipped to a fabric store in Colombia. We had a fascinating conversation about the market there. Not only was the exchange enlightening, it also gave me a welcome opportunity to practice my Spanish language skills. Not much chance of that where I live! The teal color was pulled from my stash for the setting triangles and border. The two quilting designs are Lob and Betty Flower, both by Helen Baczynski. When quilting this, I challenged myself to do the entire quilt with point to point designs. When finished this quilt, I felt that I had successfully mastered this technique! The border design is a variation of Helen’s Lob pattern, which I adapted to make a point to point border design. In the four patches, the thread is a Superior green/blue variegated poly. In the purple, the thread is Superior So Fine in purple. 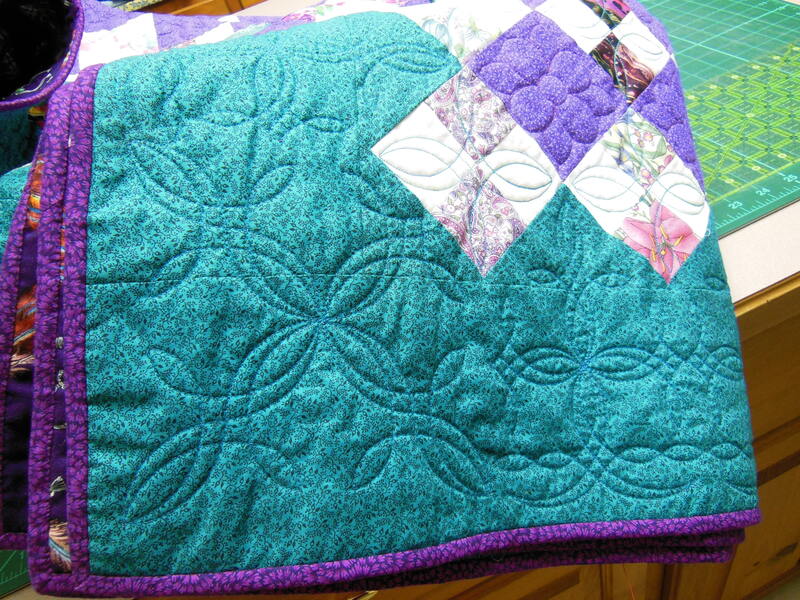 The border is done with a poly in a teal colour and the bobbin thread is Superior Bottom Line in a purple. The binding was applied to the front and hand stitched to the back. The fingers and toes peeking out from the quilt belong to my husband and Roger, a cottage guest from Dallas, Texas and brother of our friend Amy. Roger and his wife Jerre were enjoying the respite of beautiful Muskoka temperatures which they found to be significantly more refreshing than the 110 degrees they had been experiencing at home. It is hard for us Northerners to imagine that degree of constant heat. The finished quilt goes into my wedding quilt stash from which I invite brides to make a selection of their preferred quilt. We have four weddings this year, so I’d like to get a few more quilts done to give the bride a wide range of colours and styles. I find that people have strong emotional reactions to quilts and that different people react very differently to the same design. It is quite fascinating! My kids and I make predictions on which quilt the bride will choose. Occasionally we are right! 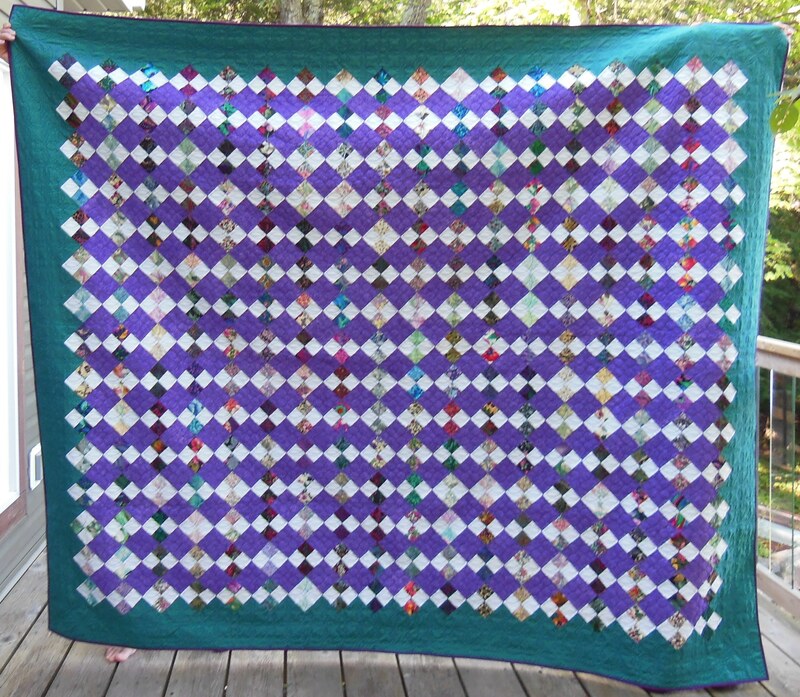 Update: August 2013 – This quilt won the prize for Grand Champion, Machine Quilting at the Drayton Fall Fair, August 2013. The log cabin quilt is progressing nicely. The top is complete and it is now on the machine. The quilting is quite dense and I can complete three blocks per hour. There are still a few rows to quilt, so I will be spending a bit more time on this, but expect to have it complete tomorrow. I’ll put the french fold binding on the front and then take it with me to the cottage for the weekend, where I can hand stitch the binding to the back at a leisurely pace. The quilting design is Majestic Pines by Donna Kleinke of One Song Needle Arts. I love both the artistic nature and the density of her designs. The outdoor woodsy theme of this design suits this quilt well.